Houzz 27 of our visitors have told a friend about this plan. 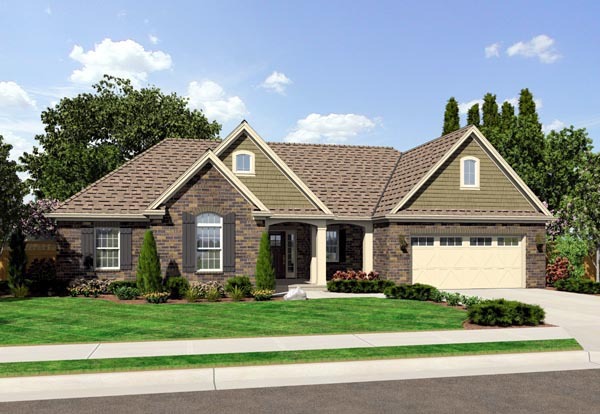 This lovely one-story home showcases a solid brick front with wood trim and arched window. The large Great Room, Dining and Kitchen areas open generously to create a spacious gathering space. The breakfast bar at the Kitchen provides expanded seating for quick meals or an oversized crowd. The Laundry room is located conveniently to the Kitchen and expanded space in the Garage provides a wonderful storage area. A Master Bedroom with private bath is set to the rear of the home and two additional bedrooms round out the first floor, to make this a perfect empty nester home or one that offers years of enjoyment to a growing family. An open staircase leads to a full basement that can be accessed for additional living space. A rear porch offers outdoor enjoyment. Question: How wide is the hallway with the bedrooms? Answer: Thank you for your question on our house plan. The Hallway that runs between the bedrooms is 3’2” wide. Question: How big is the closet in the master bedroom? Answer: The closet in the master bedroom is 8’-10” x 4’-11 1/2”.